Joyous surrender to the natural order, rather than assertion and control over the forces around us, marks the vision of Indian art. Bodhisattva, Tabo Monastery, 11th century A.D. 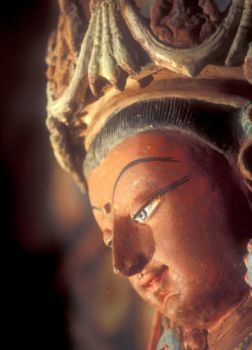 The serene face of the Bodhisattva displays the sublime quality of the classic art of India. This is one of the clay sculptures on the walls of the Tabo Monastery, which constitutes a Vajradhatu Mandala. In the late 10th and early 11th centuries A.D., King Yeshe Od of Guge is believed to have initiated the building of 108 monasteries across his kingdom (parts of Ladakh, Lahaul-Spiti, Kinnur and western Tibet). This was known as the Second Diffusion of Buddhism in the Trans-Himalayas. AN artist presents the world around him, shaped by how he sees it: by his perceptions and beliefs. The early art of India is a valuable record of the vision of one of the most ancient civilisations of the world. What makes it so fascinating is that this is a culture that continues to this day. The art of ancient India brings before us a vision of great compassion. It is a view of the world that sees a harmony in the whole of creation. It sees the same that is in each of us, in the animals, the flowers, the trees, the leaves and even in the breeze that moves the leaves. All that there is, is seen to be a reflection of the One. Series:The first part of a 25-part series on Indian art. The phenomenal world of separated beings and objects seen around us is an illusion, perceived and brought to us by our senses. This information provided by our senses is of a personal and not an objec tive nature. Absorbed in this, we are blinded to the reality beyond. The primary illusion is the perception of ourselves as individual entities, which leads us on a path of egoic existence. On this path, we are distanced from the truth. The high purpose in life is to seek reintegration with the One, to perceive ourselves as part of the beauty of the One, the Divine. To see oneself as a part of the divinity of existence. And thereby to lose the pain of a life caught in the web of endless desires. This sculptural relief of the first century A.D. was excavated recently in Panigiri, in the Krishna Valley in Andhra Pradesh. This is a stupa’s vedika relief depicting the birth of the Buddha. The fertile valley of the Krishna river was the cradle of civilisation in the eastern Deccan. At the dawn of the first millennium, it was known for its fine textiles, particularly cotton. There was a flourishing trade with Rome, and large quantities of Roman coins have been found in this region. This area became one of the greatest centres of Buddhism. Over 140 early Buddhist sites have been listed here. Queen Maya gave birth to the Buddha while standing under a sal tree. The artist depicts her in the continuing style the Shalabhanjika, who presents the flowering abundance of nature. The aesthetic experience is considered to be of great value in Indian thought. It lifts the veils of illusion that hide the truth from our eyes. Our experience of beauty when we respond to a sunrise or to a great work of art is seen to be a moment when we perceive the Grace that underlies the whole of creation. In that moment the veils of illusion of the material nature of the world are lifted and we see beyond…In that instant it is not our material preoccupations that fill our consciousness and thereby blind us to the greater reality. The moment of the aesthetic experience is stated in Indian thought to be “akin to brahmananda”, or the final ecstasy of salvation itself. Therefore, art has played a most important part in the life of the Indian subcontinent. Chitrasutra of Vishnudharmottara Purana, which was penned out of earlier oral traditions in the fifth century A.D., is perhaps the oldest known treatise on art in the world. It states that art is the greatest treasure of mankind, far more valuable than gold or jewels. There are no gods in the early philosophic vision of India. There are deities: deities who are the personifications of concepts and qualities. The qualities are within us, and by responding to these deities brought to us in art, we awaken those fine aspects within us. Looking upon these, meditating upon these, helps fill us with those fine qualities so that eventually those best parts of us grow and fill us. When we are filled by that Grace, there is no space left for base desires and pain: we have become that deity. The Buddha preaching, Sarnath, fifth century A.D. (ASI Museum, Sarnath). This is the classic image of the Buddha that was developed in the Gupta period. 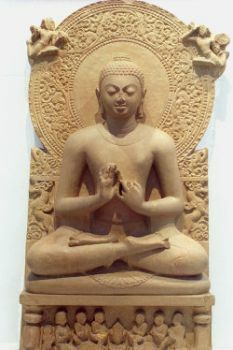 The mudra suggests that he is teaching and setting in motion the wheel of Dharma, also seen in the panel. The inward look, with the gaze centred on the tip of the nose, conveys a great sense of peace and tranquillity. For the Indian sculptor, the Grace of divinity is everywhere. The stone before him contains the image of the Divine, and it is for him to but remove the outward aspects and to release that form that is within. It is not only a personal joy of discovery and creation, it is also one of sharing the beauty inherent in the world with others. The creation of art in India has been a process of meditation: a process of a life spent in worship and discovery. The creation of the beauty of form is for the sculptor a joyous rediscovery each time of the glory and beauty that is divine. The sculpture of India is naturalistic in a vastly different way from the art that attempts to portray only the transitory shapes of the objects of the world. Here, naturalism is the expression of that sense that moves beneath the surface of objects, that inner being of trees, animals and people: the spirit that moves the whole of creation. As ego and belief in one’s identity is considered to be an illusion of our limited sensibilities, the focus is never on the individual. For about a thousand years in early times, vast quantities of art was produced in India. This depicted deities, mythical creatures, animals, plants, trees, forms that combined these beings in a great harmony, and also common men and women. Yet this art never depicted the kings who patronised it. Nor was the name of the artist mentioned. According to Chitrasutra, the treatise on art-making, personalities are too unimportant to be depicted in art. The purpose of art is a noble one: to show the eternal beyond the ephemeral. 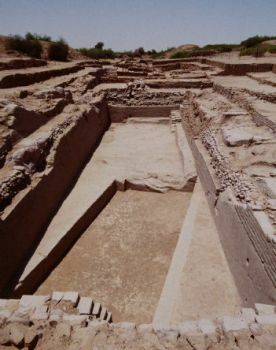 The Indus Valley period site of Lothal, in present-day Gujarat, has a large structure that has been identified as a constant-water-level dock. This represents an advanced engineering feat. There is a great deal of evidence that the Indus Valley cities traded extensively with other civilisations of that period. Mesopotamian records mention trade with Indus cities, and objects from the Indus region have been found in West Asian cities. Thus, works of art were meant to convey the Truth as experienced yet again by the artist. No thinker nor any artist claimed that it was solely he who had seen the Truth. Each teacher of the ancient period in India, including the Buddha and Mahavira, stated that he only followed in the footsteps of others who went before him. The emphasis was on the loss of ego and not the perpetuation of it. And art was a prime vehicle of the communication of these ideas. Images from the material life are very often used in art. The achievement of knowledge is likened to a victory. We see images of deities trampling the demons of ignorance. However, the demons smile as they are vanquished. In this world, where all is seen as part of a cosmic whole, there is no anguish finally. The richness and complexity of the life experience is presented. Our perception of the material world is not denied. The interchanging perceptions in our minds and senses of the ephemeral and the eternal are described as a lila, a dynamic play. In the search of the Truth, the experience of this lila cannot be avoided, and there is no attempt to deny this reality. One of the greatest contributions of this philosophic stream is that there are no contradictions seen between the spiritual and the world of the senses. The art of this tradition is an abundant sharing of the life experience. It sees our perceptions, from the sensory to the highest realms of the spiritual, as a continuous path. It harnesses our faculties and perceptions to help us understand and reach out to the Divine, through all that is around us. This philosophy does not seek to deny our response to the beauty we perceive in the world, including the human forms around us. In fact, it sees this beauty as a reflection of the glory of the Divine. The beauty of the human form, which is constantly before us in life, is not presented in a manner that would awaken base desire and pull us down with its burden. This art sees the grace in all human and other forms as an aid to awaken a joyous understanding within us. It seeks to elevate us through our aesthetic response. Indus Valley seals (National Museum, New Delhi). More than 4,000 seals have been found during excavations at Indus Valley sites. In the middle seal above, there is evidence of the fully developed concepts that underlie later Indic philosophic streams. These include the formal, possibly yogic, posture and the seat of the figure with animals made in it. The pipal tree, in the lower seal, is one of the identifiable plant species seen on the seals, and it continues to be an important symbol in later Indic religions. 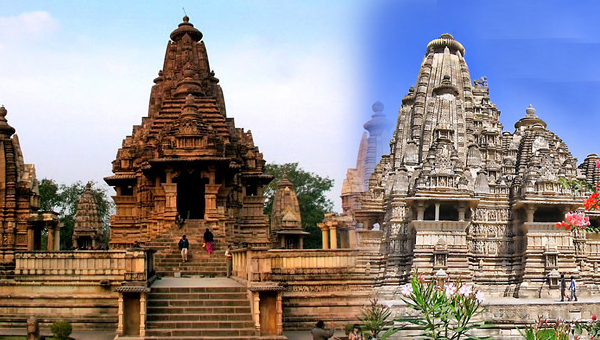 There is evidence everywhere in Indian monuments of a great cosmopolitan culture from earliest times. There are Buddhist art and pillars in India that were patronised by Greeks, Parthians and others from far away lands. Influences of art from everywhere were received warmly and some of them continued in the main flow of art through the centuries. Artistic styles, motifs and iconography spread swiftly in early times to all corners of the country. Therefore, we find that there were pan-Indian themes and artistic styles from ancient times. Regional variations and colour add further richness to these traditions. What survives today of the early art of India is only a small fraction of what was created. Yet it consists of such vast numbers of monuments and sculptures that it staggers the mind. The corpus is gigantic and has spread to every corner of the subcontinent. 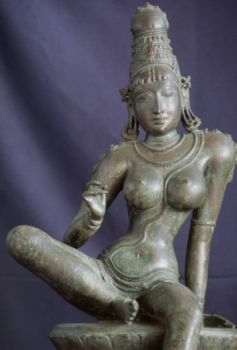 Parvati, Chola Bronze, Tamil Nadu (Saraswati Mahal Art Gallery, Thanjavur). The bronzes of the early Chola period are among the masterpieces of the art of India. The depiction in the "garbha griha" were made closest to the formless Divine, such as a Siva linga. In South India, there also developed a tradition of utsava murtis, in which the deity came out of the "garbha griha" and, even the temple, to give "darshan" to the devotee. This resulted in portable images of the Divine, such as the tradition of South Indian bronzes in the medieval period. In the fourth millennium B.C., one of the earliest civilisations of the world was developing in the river valleys of the Indian subcontinent. The basic cause for this was the growth of agriculture. Instead of fighting for survival, people could now begin to improve their lives. The first sites of this civilisation were discovered in the basin of the Indus river, and the name Indus Valley civilisation has remained. 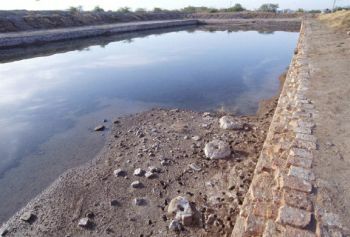 However, hundreds of other sites have been found in recent decades over a vast area, including coastal Gujarat, Maharashtra and eastwards up to Uttar Pradesh. Estimations of the area covered by this civilisation vary from 1.2 million square kilometres to 2.5 million sq km. In any case, it was by far the largest area of any civilisation in the world at that time. There was a sophisticated concept of town planning. The cities that have been excavated reveal that there were well-planned grids with broad main roads and smaller lanes intersecting at right angles. There were large networks of hundreds of wells, which supplied water to the residents. A sophisticated drainage system was in existence and even the smallest houses were connected to it. Houses were made of fired clay bricks. The standardised dimensions of these bricks, found in the many cities across this civilisation, are remarkable. The houses had several storeys. Excavations across this culture have not revealed evidence of military forces or weaponry for warfare. While the art of other civilisations has many images of prisoners, monuments to war victories and of other activities related to warfare, the art of the Indus Valley has not a single such depiction. Mahisasuramardini, eighth century A.D., Mamallapuram. This depiction of Durga, which is one of the treasures of Indian sculpture, shows the goddess killing the demon of ignorance in the form of a “mahisha”, or buffalo. In Indic thought the only evil is that of our own confusion, or lack of knowledge of the truth. Deities such as Siva and Durga are shown attacking and vanquishing the demons of our ignorance. 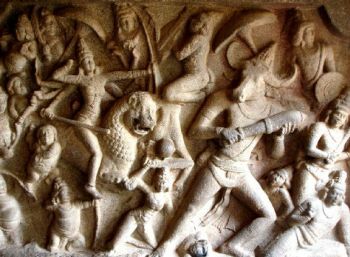 The battle of Durga and the “mahisha“ is one such depiction of the victory of knowledge over ignorance, of good over evil. The site of Lothal, in present-day Gujarat, on the western coast of India, has a large structure that has been identified as a tidal dock for sea-faring ships. There is a great deal of evidence that Indus Valley cities traded extensively with other civilisations of that period. Mesopotamian records mention trade with cities here, and objects from the Indus region have been found in West Asian cities. More than 4,000 seals have been recovered in excavations at Indus Valley sites. These were used to mark trade goods and for other purposes. Most of these seals combine text with images of animals, plants and persons. They are made of clay, stone or copper and would have been pressed into soft clay to leave their impression. The writing of this period has not been deciphered as yet, so many of our questions about this culture remain unanswered. It is the art of the Indus Valley civilisation that provides vital clues to understanding it. As with any culture, art provides a glimpse of the political, social and religious ethos that underlies it. Koranganatha Temple in Tamil Nadu is a Chola structure of the late ninth or early 10th century A.D. Chola temples of this time have some of the finest examples of Indian sculpture. 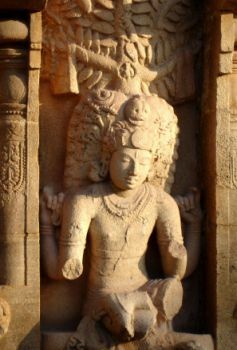 A benign and peaceful Siva as Dakshinamurti is seen at the south of the temple's tower. It is a view of the world the artist shares with us, which is filled with the harmony of the natural order. As the devotee goes around the temple, he perceives the world in its deep essence of beauty and quietude. Animals such as bulls, elephants, bisons, rhinoceroses and crocodiles are depicted in a highly naturalistic manner, even within the small space of the seals. Different breeds of bulls can be distinguished in these representations. This points to an art form that had reached a high level of development and sophistication. The artist did not only observe the world around him closely, he also had the means and skill to translate that observation into pictorial form. One of the most fascinating seals from Mohenjodaro is the one depicting a man sitting cross-legged on a seat. The posture is very significant. The splayed arms with the palms held over the knees and the crossed legs are formal gestures, very similar to yogic asanas, or postures, and mudras, or gestures. The torso is serrated with diagonal markings, which give the appearance of a tiger’s skin. The figure is flanked by several animals, leading some to identify him as a prototype of the later Siva, who is also known as Pashupati, or the Lord of Beasts. The seat on which he sits indicates his high rank. Animal figures are made on the seat, as is seen in the depictions of seats of deities in later Indian art. 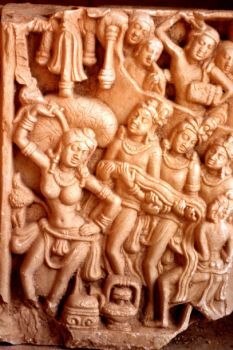 Such seats, as well as the other elements of this depiction, are very similar to the images of Hindu and Buddhist deities in later Indian art. In any case this figure does show the prevalence of a system similar to that of yoga, which has continued as an essential aspect of the spiritual life of India. Yoga and meditation, which serve to connect a person with the universal, are common to all Indic philosophic streams. The pan-Indian belief in the deep interrelatedness of all beings in existence is also perhaps seen from here onwards. 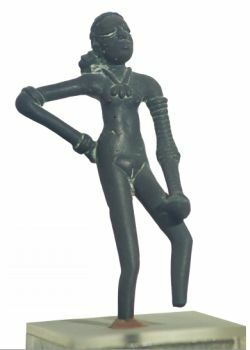 The dancing girl, metal figurine (National Museum, New Delhi). Approximately 10 cm in height, this tiny figure stands with one hand on her hip. She is resting her weight on one leg in a very natural fashion, as in the contraposto techniques of later sculptures. The jaunty manner and liveliness of the figure are remarkable. The art of the Indus period shows great observation of the natural world and care in representing its forms. At the same time it shows the concern for the world beyond that of everyday experience. It is this concern for both the material world as well as eternal concepts that becomes the hallmark of Indian art in later millennia. The artefacts that have been excavated from the Indus Valley civilisation are unique in their small scale. No monumental sculpture has been found. All the art objects, whether in terracotta, stone or metal, can be described as being on a human scale. This is surely also related to the fact that no palaces or other monumental architecture has been found. All excavated evidence points to the existence of a cooperative system and not a conventional kingship. Monumental structures and art that displayed royal authority only followed much later in the Indian subcontinent. The high level of the development of art can also be seen in the use of a variety of materials. The artist was not merely using those materials that were most readily available to him in the area. Instead, specific artistic and aesthetic choices were made, and objects were fashioned from pliant terracotta to hard stone and metal. Many of these materials obviously came from far away. A variety of styles were also in vogue in the Indus Valley art. These range from the highly naturalistic to abstract and stylised forms. The naturalism that is seen in the depiction of animals on the seals is matched by the vitality of the stylised figure of the Dancing Girl. The figurines of animals and birds that are fashioned from clay are also highly abstract, communicating through their simple forms, the essence of the being that is depicted. Both the naturalistic and stylised trends continue through later periods in the subcontinent. Dholavira, Gujarat, an excavated site of the Indus Valley civilisation. The civilisation is marked by an advanced concept of town planning. Excavated cities reveal a well-planned grid with broad main roads and smaller lanes. One of the most delightful figurines is that of the Dancing Girl. Approximately 10 centimetres in height, this tiny figure stands with one hand on her hip. The body is composed of long tube-like limbs. She is shown resting her weight on one leg in a very natural fashion, as in the contraposto techniques of later sculpture. The jaunty manner and liveliness of the figure are remarkable. The figure has been depicted unclothed but adorned with heavy ornaments. Around 1700 B.C., with changes in the course of the rivers, many of the settlements in the river valleys had to be given up. In this period, populations began to move south into Gujarat and also eastwards into the valleys of the river Ganga. The story of art is the story of humankind: of human perceptions and thoughts. From the early river valley civilisation onwards, we see the foundations of the art of one of the oldest civilisations of the world. We see a vision of the world and the roots of a culture that has survived for more than 5,000 years. It is a culture based upon the belief of an underlying unity of the whole of creation. Joyous surrender to the natural order, rather than assertion and control over the forces around us, mark the vision of life and art in the centuries to come.